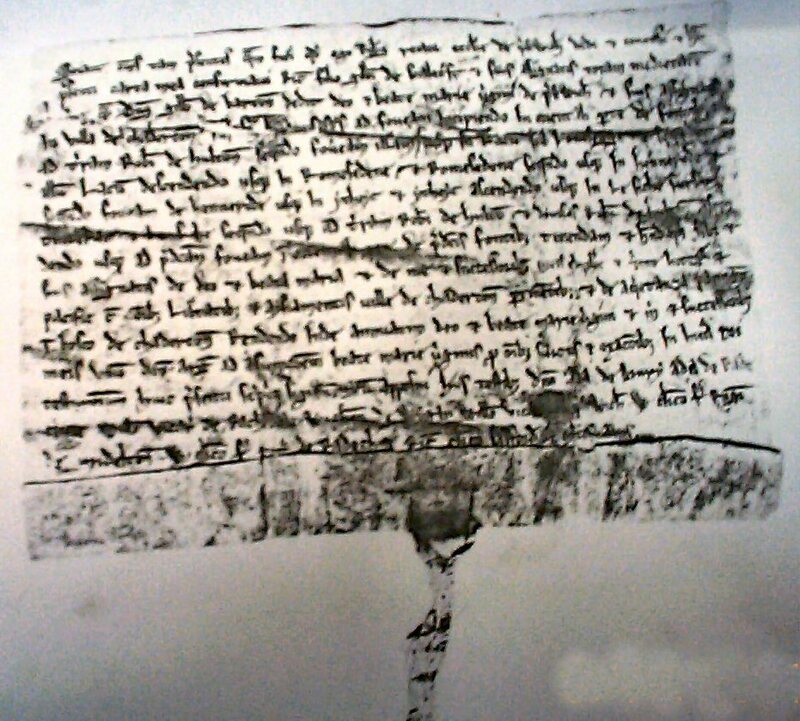 The earliest mention of the place of Prestwich is thought to be this grant from about 1220. 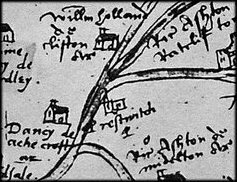 From an Agecroft Hall Museum leaflet (Virginia) and 'Salford Through the Ages'. The Pendleburg Manor came into the possession of the Prestwich family when, in about 1291, Adam de Prestwich married Cecily, a Great Granddaughter of a Master Sergeant of Salford. In 1316 Adam de Prestwich left Pendleburg to his eldest son Robert. From Robert, the manor passed to his eldest brother Thomas's daughter, Margaret, as the Black Death ravaged the family in 1349. Not long after, Margaret also succumbed to the plague. Thus, while the renowned John of Gaunt was still alive, and coupled the title of Duke of Lancaster with that of King of Castile, the Pendleburg manor passed into the hands of Joan de Tetlow as sole surviving heir ( as cousin of Margaret de Prestwich). About 1350, Joan married Richard de Langley , member of a family that had come to England with William the Conqueror and had built a church at nearby Eccles, as early as 1100. Richard Langley's career in the clergy had taken a dive when he fatally stabbed another clerk in the neck with a bodkin (arrow head) at Oxford in 1343. He was found guilty, but he went on to become the Lord of the Manor of Prestwich through his marriage to Joan, and took residence in Agecroft Hall. 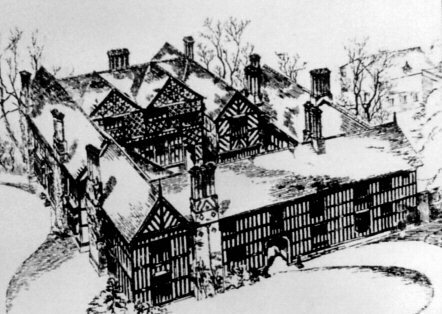 Agecroft remained in the male line of the de Langley's until 1561, when, with the death of Sir Robert de Langley, the property passed to his daughter, Anne,who married William Dauntesey (Dauntsey), son of RichardDauntesey of Lavington Wilts., gentleman usher to Queen Katherine Howard, fifth spouse of the oft-married Henry VIII. Click for an early sketch [Courtesy of Manchester Libraries and Archives] of the Hall prior to the Elizibethan re-facing of the South and East Wings in the 16th Century - note the double chimney (later to be triple) and lack of extension to the right - at this time the Hall was an "L" shape. This transfer to Anne, in 1571, occurred three years before Shakespeare was born and three years after Elizabeth had become Queen of England. The above family tree shows Adam de Prestwich, born 1320 with at least 2 wives. An alternative though discredited view is that there were two Adam's, shown in the the trees below. 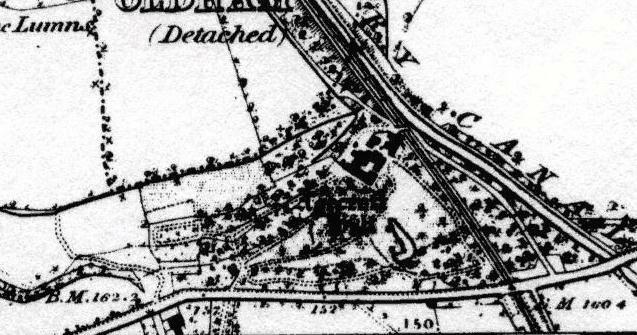 Grounds as of 1848, note the intrusion of the Manchester, Bolton and Bury Canal and the Railway. The Hall was originally surrounded by a moat that later became the fish pond. Agecroft Hall looking down on the corner of the Old Chapel - originally the courtyard was overlooked by open galleries which were later enclosed along with the cloisters. Lady Joan de Langley(formerly Joan de Tetlow b: abt.1330), was grieving the death of her Lord (Sir Richard de Langley b:1325) in the French Wars, and left her son (Roger b:1360) in the wardship of John of Gaunt, Duke of Lancaster. On the morning of the Feast of Ascension (the 40th Day after Easter Sunday) in 1374, the villainous Robert de Holland "with many others assembled with him, armed in breast plates and with swords, and bows and arrows, by force took possession of the said lordship of the duke, in defiance of the Sheriff, and to the contempt of the Lord Duke". Young Langley and his sister escaped to the shelter of the forest which covered the slopes of the Irwell valley, cared for by loyal retainers until Lancaster rescued them. Thomas, Cardinal Bishop of Durham, who's bed was removed from Agecroft to the Dorset home of the Dauntseys upon the relocation of the hall, laid a curse on the family for deserting the old faith, and that the line should perish for want of an heir. 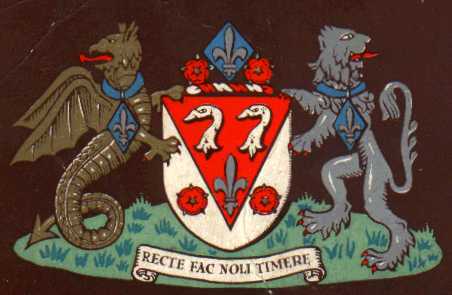 As it happened, the line of succession was broken due to the Black death (around 1349), eventually falling into the possession of his cousins, the Hulls, and each successor had to adopt the name of Dauntsey. Agecroft is also credited with introducing Tea to England. A member of the family in 17th century sent home some "chaw" whilst serving with the navy in China. Unfortunately he did not provide instructions, the leaves were boiled, then the juices drained off and disposed of. The remaining leaves were not very appreciated. A Langley is also credited with introducing clogs to Lancashire.